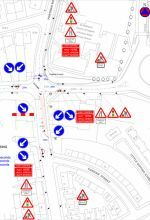 The Palmer Group take Traffic Management very seriously. 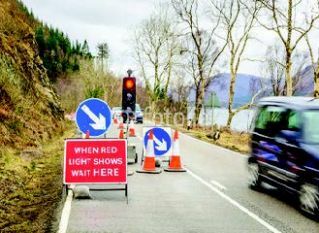 Ensuring a safe environment for operatives working on a road related project is paramount as is keeping the public safe with the minimum delay to their journey. Once the project has been completed in an efficient and timely manner all equipment is removed leaving a clean and tidy area. 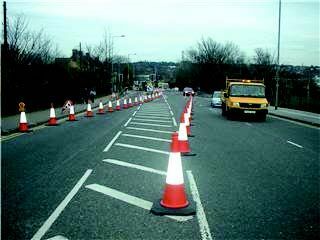 With every traffic management request an assessment is carried out to ascertain any possible hazards, the size of workforce required to complete the project and the possible effect to the public. 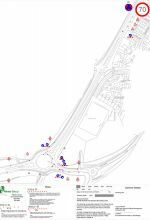 Using their dedicated in-house CAD department an experienced member of their design team will create a layout drawing using current Ordnance Survey data and submit this along with the relevant information to obtain the essential TTRO (Traffic Order). From time to time, often due to a road traffic collision, it is necessary to respond quickly and efficiently to a reported situation. 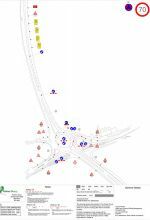 Whatever the road type, be it single, dual or motorway, the Palmer Group have the operatives, materials and experience to secure the road layout with the minimum of fuss and as quickly as possible. With many years experience The Palmer Group have achieved a safety reputation that is second to none. 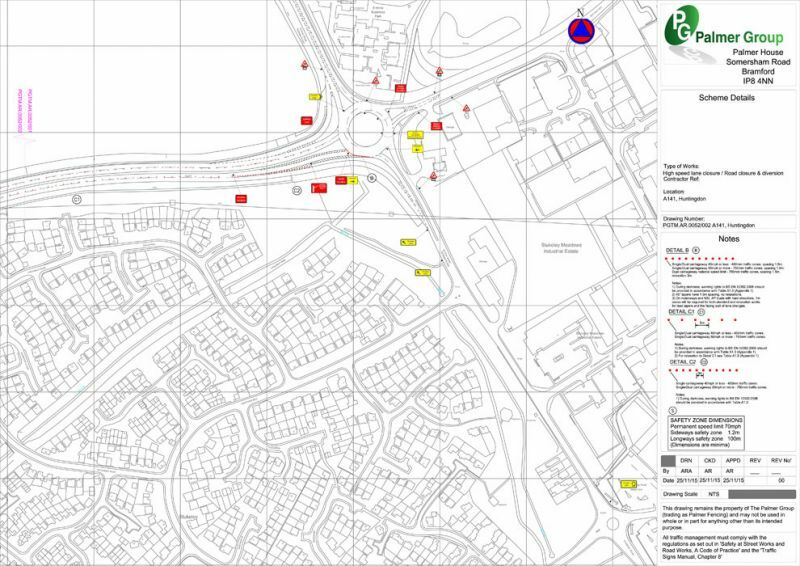 All necessary risk assessments are carried out and a CAD drawing produced to establish the area layout when required. Where work is applied to pathways the appropriate signs and barriers are put in place guiding the public safely around the potential hazard. 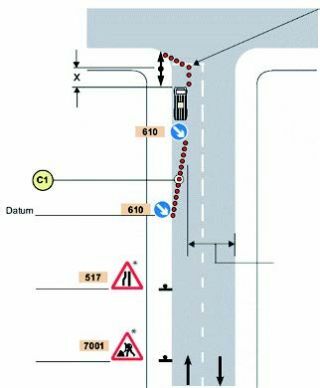 Additional consideration and traffic control is also applied when required. 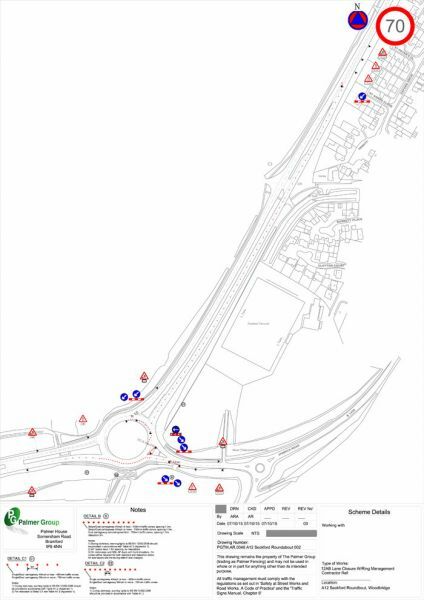 With a thorough understanding of pedestrian and traffic management the Palmer Group team can supply a solution that is efficient and cost effective. Many events will attract an increase in both traffic volume and pedestrian movement and the Palmer Group coordination team have the experience to make this important part of the event run smoothly. 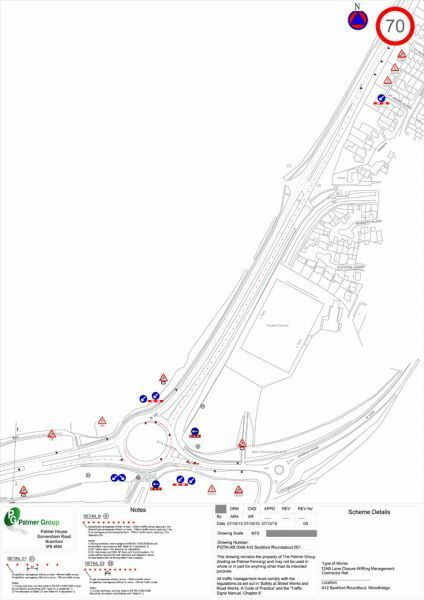 Essential to most projects is a clear, accurate site survey of the work involved, road layout and possible hazards to both operatives, road users and pedestrians alike. 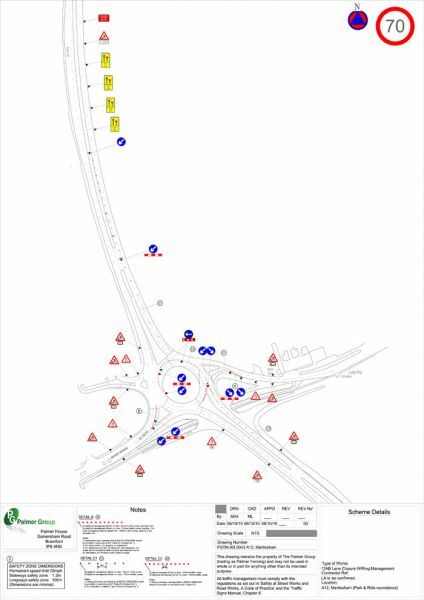 As with all traffic management projects the CAD drawing form an essential part of the Traffic Order application. 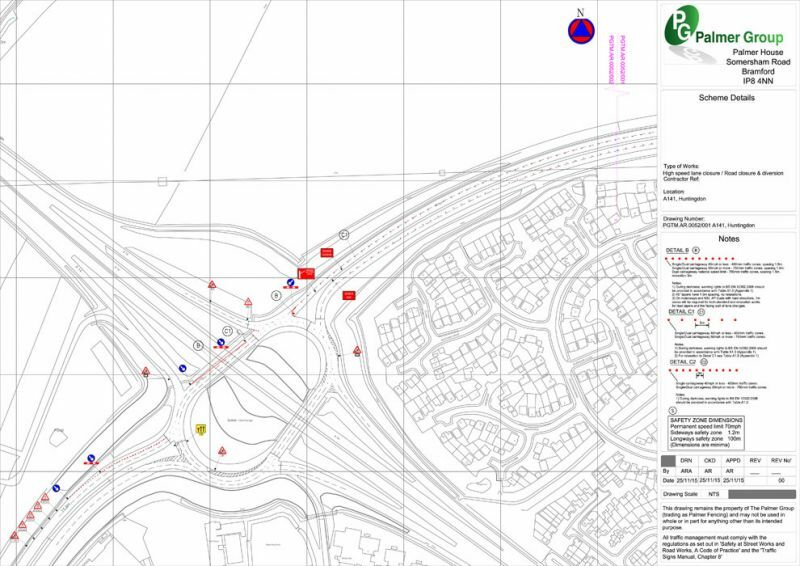 The CAD drawing will provide the measurements required by traffic engineers allowing a thorough understanding of the necessary changes to all aspects of the environment. Inspection of the area is carried out to determine the best solution for the site and any potential hazards. 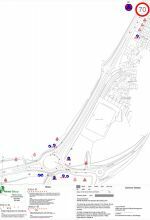 The expert site survey team will advise the precise measurements which will be incorporated into the final design. 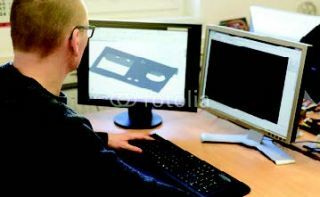 The Palmer Group will undertake any CAD Design project regardless of size, complexity and road type. 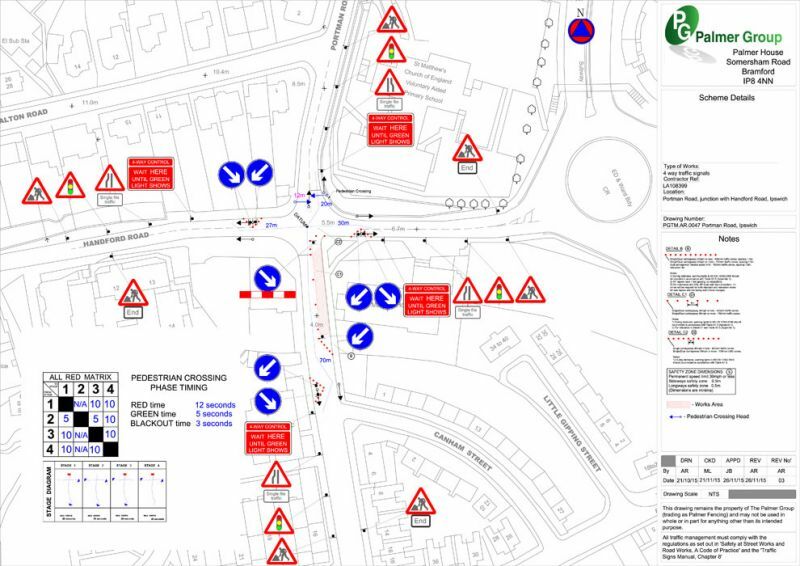 Using the latest industry standard software all drawings are clear and scalable and apply to Chapter 8 and the Road and Street Works Act 1991. 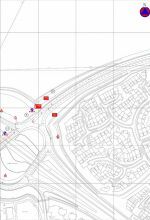 Drawings are produced using the latest Ordnance Survey data and are checked by a senior Palmer Group member prior to submission to ensure the accuracy and suitability of the suggestions and details shown. 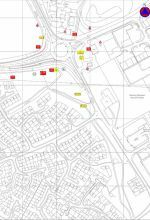 The approved drawing is then supplied in an emailable format or to any of the clients specification.